The flyer, which lists 44 different side effects including brain damage, cancer and anger, should not be taken seriously, Maine CDC says. AUGUSTA, Maine — Maine CDC issued an advisory Monday to ignore flyers listing supposed side effects of vaccines and claiming to be from the federal CDC. 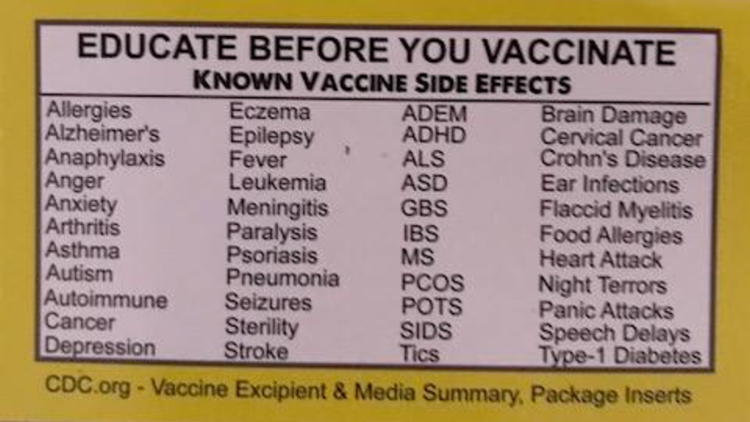 The agency says the flyer outlines a list of "known vaccine side effects" without providing references or citing any sources. Additionally, the website listed, cdc.org, is neither active nor supported by the federal CDC. The "Educate Before You Vaccinate" flyer is known to have been circulated through big box stores in southern Maine, according to Maine CDC. "Misleading flyers such as these are concerning — especially when that information pertains to something as important to public health as vaccines," said Maine CDC Director Dr. Bruce Bates. "I encourage anyone who comes across one of these flyers to disregard it." Maine CDC says immunizing yourself and your children will help protect you, them, and your community from contracting vaccine-preventable diseases. The federal CDC has a list of vaccine side effects on its actual website, cdc.gov, among which include a sore arm or low-grade fever. For more information on Maine's immunization program, go here.